Sites like Zillow and Trulia have made it extremely easy for homeowners and investors to get their properties in front of millions of eyes. According to the National Association of Realtors, 74% of homebuyers polled answered that they would use the Internet as part of their home search. Additionally, studies show that listings with professional photos generate an average of 139% more clicks when compared to similar listings without professional photos. The Wall Street Journal recently released an article discussing point-and-shoot and SLR cameras within the real estate market. 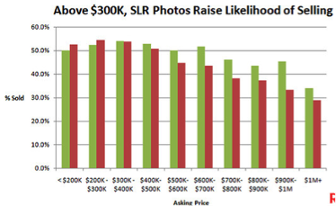 The chart showed that point-and-shoot cameras actually lose their effectiveness with homes priced above $300k. On the other hand, professional photos help increase the likelihood of selling a property priced above $300k. Many (if not most) of Real Estate professionals and investors do not use a professional photographer when listing a tattered property. What they don’t realize is professional photographers know how to capture the right angle of a property to show it in its best light. Great photos of distressed properties will help drive more traffic to your listing and ultimately more leads. 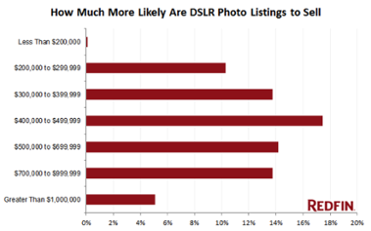 A study conducted by Redfin identified that listings with professional photos tend to sell for $1,000 to $100,000 more than listings with point-and-shoot cameras. Redfin found that high-priced homes reaped high rewards when using professionally shot photographs. Photographs can truly make or break a sale. Consider investing a little more into the marketing of your property to help yield higher returns.